I made fish soup using locally caught and sustainable hake. I do not like the word diet. It conjures up starving yourself, or fads. I like the term healthy eating plan instead. This year we changed our eating plan. We’ve always eaten healthily but this year we made some changes. I can tell you after 4 months that this works for us. We’ve cut out carbohydrates in the form of pasta and potatoes every week night. I’ve not bought potatoes this year, and even though I consider myself a bit of a potato addict, I’ve not missed them. We are eating pasta at the most once a week and each dish is special instead of a boring use of what is in the fridge. I’ve not lost much weight, but I am slimmer. I am training 3 times a week and a lot of the wobbly bits have firmed up. As muscle weighs more than fat I am well pleased. I stopped drinking wine during the week for the first two months of the year to aid the new plan, and now I’m back to enjoying a glass with dinner each night. I have cut out sandwiches during the week which means lunch has to be thought about. I’m enjoying fruit and yoghurt or oats for breakfast and salad and boiled eggs for lunch. All told, I feel great and healthy and to me, that was the ultimate aim. Over the weekends Dave and I have indulged in hotdogs and wraps, but I decided that I could make a hot lunch for us, if the weather called for it. I love being in my kitchen, especially when it is raining. Here is a great rainy day soup recipe. hello sweetie! I am trying to get the photo’s sorted out and then I will share my lovely holiday! Hi Tandy, We eat very similar to the two of you and when we have our pasta, potatoes and rice they are all the more special. If you want a snack in our house it is nuts…that is it. Dessert is only for when we go to a restaurant if then. My husband just got his test results from his annual physical and every thing was great! 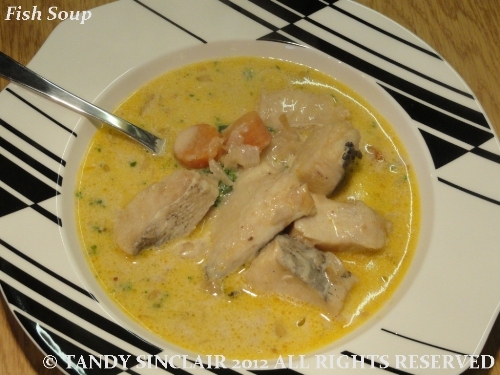 I love the sound of the fish soup with both mustard and curry. That is so great when the hard work in eating healthily pays off! Looks delicious. I also hate the word diet, but love healthy dishes that aren’t forced. Katherine always says if you want healthy eat salmon and greens, don’t try to lighten up a lasagna. Looks awesome! I think Bam’s comment of subbing coconut milk sounds great too! Kudos to you and Dave for taking carbs out of your “diet”. Not sure I could do that! Your fish soup looks and sounds scrumptious. I love fish soup. I usually make my bouillabaisse with a tomato base but your version looks very tasty! Well done on the changes you have made – all very sensile. And a lovely fish soup – I adore hake! I love the flavor combinations in your fish soup. I am lactose intolerant so will have to switch up for soy milk or coconut milk and I am in. Yum!